This week saw Muslims in Bermuda join with Muslims from all over the world to celebrate the festival of Eid Al-Adha. Eid Al-Adha is commonly known as the bigger Eid, the other being Eid Al-Fitr which is mostly known for the Eid celebrated at the end of Ramadan. Eid Al-Adha is celebrated to honour the obedience of the Prophet Ibrahim (Abraham) to sacrifice his young first-born son Ishmael as an act of submission to Allah’s command and his son’s acceptance to being sacrificed. Wow, just imagine that, what love and total faith both father and son had to have for Allah to be willing to comply with His command for the father to literally end his son’s life. I don’t think many fathers would do that today, nor would their sons let them, especially for the sake of God. These were people of immense faith, love and obedience to Allah. However, Allah being the Merciful One that He is intervened to provide Abraham with a lamb to sacrifice instead of his son. Alhamdulillah! The Quran versions of this story found in surah 37:112: “O my Lord! Grant me a righteous (son)!” So We gave him the good news of a boy, possessing forbearance. And when (his son) was old enough to walk and work with him, (Abraham) said: O my dear son, I see in a vision that I offer you in sacrifice: Now see what is your view!” (The son) said: “O my father! Do what you are commanded; if Allah wills, you will find me one practising patience and steadfastness! “So when they both submitted and he threw him down upon his forehead, We called out to him saying: O Ibrahim! What a beautiful story of love and reward. Eid Al-Adha falls on the 10th day of Dhu Al-Hijah and lasts for four days. The start of Eid occurs after the descent of the pilgrims (Hajjes’) who have completed the fifth pillar of Islam known as Hajj from Mount Arafat. Mount Arafat is a well-known hill east of Mecca and I believe ii is mentioned in the Bible. The day of Eid starts out with sunnah prayers of two rakats followed by a khutbah (sermon). 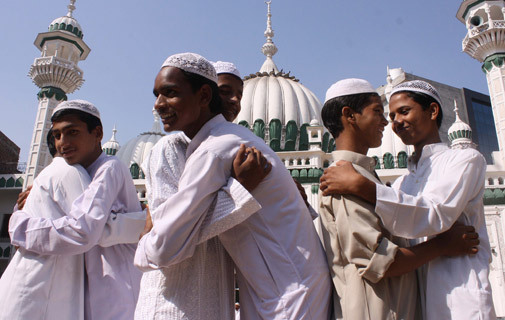 During the Eid family and friends gather for meals wearing their finest attire, Gifts are exchanged and relationships are mended. It is a time to renew and redirect our affairs to what is positive and pleasing to Allah. The Eid is observed by sacrificing a sheep, cow, goat, or chicken in the name of Allah. The meat of the sacrificed animal is given away to friends and neighbours and to the poor. Zakat is also required to be given before the start of the Eid prayers, being another opportunity to give to those less fortunate than ourselves. This week Bermuda gave a zakat to a steward of our society whom was in need. What a wonderful outpouring of national love and support. It reinforced my hope for Bermuda, that we are still a connected and caring people, even though our own circumstance may also be bleak, we are still willing to assist and give.